An integrated learning experience run by Ian Luff and suitable for any licensed driver irrespective of experience. Known as Defensive Driver Training, this program is a must for any driver, regardless of skill level. Key elements - 'Driver', 'Vehicle' and 'Environment' are broken down into individual structures linking theoretical information with practical application. Soft plastic safety cones are used at a closed private venue to simulate what can happen on public roads. The program is relevant to the vehicle you drive, large – small, sports car, commercial vehicles or four wheel drives. This program offers you the chance to learn in a safe and controlled environment in your own vehicle. 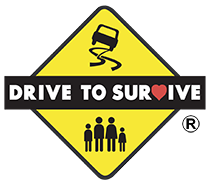 Companies use the Drive to Survive program as a positive way to reduce fleet running costs, while meeting their obligations of OH&S. Ian's expert team of highly skilled personal trainers are the best in the business. They understand that individuals have different learning abilities which makes the program a thoroughly rewarding experience. The knowledge and skills gained could one day save you, or another's life. If you lack confidence, this experience will help you develop a positive mindset to better assimilate with the busy road environment. For some drivers motoring is more about the journey, Ian's defensive driving program provides the essential building blocks before advancing to a higher level or entry into motorsport. Aussie Formula One driver Mark Webber kick started his career attending Ian's Drive to Survive defensive driving program in the mid-nineties. He then went onto graduate to the next level – 'Performance Driver Training' while working for Ian as a member of our personal training team.